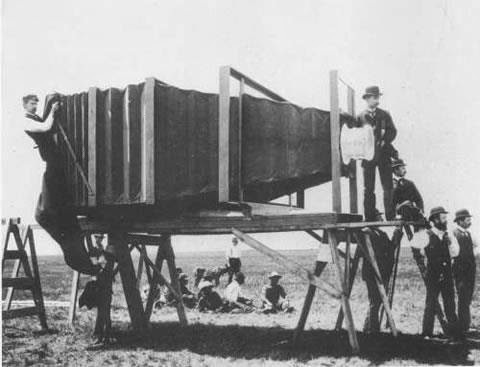 The Mammoth camera was manufactured by the J.A. Anderson Company, Chicago in 1900. It was designed as the largest camera every made in order to capture a complete train with cars. The Chicago & Alton Railway had built a special train to go into fast daylight service from Chicago to St. Louis and wanted it photographed. Mr. Charlton, the director, believed ...his train to be the handsomest in the world and he wanted a photograph of it, six long Pullmans, engine, tender and all. He called the company's photographer, and said it was necessary to have a photograph 8 feet long of the " Alton Limited. " The photographer explained that the train would have to be photographed in sections, and these sections fitted together during the process of printing. But he felt obliged to add that this was an ordinary method which was not conducive to absolute truthfulness of perspective, and one which would certainly show the joints, no matter how carefully the different sections were blended together. But the directors did not want a half-and-half photograph. They had built a faultless train, of which they demanded a faultless photograph, and it must be a photograph at least 8 feet long. The photographer assured them of his helplessness in the matter, but the directors were more than obdurate; they insisted. At last a truce was called, and the railway photographer left the boardroom with an idea. When, sometime after the conference, the photographer returned, it was with the plans for a camera holding a single plate 8 feet by 4 1/2 feet, this being three times as large as the largest plate ever before exposed. The Chicago & Alton Railway, then and there gave Mr. Lawrence, their photographer, carte blanche to have such a camera made. The enormous instrument was manufactured by J. A. Anderson, of Chicago. It took two and a half months to build. It is finished throughout in natural cherry wood. At the back of the camera is a small track upon which two focusing screens run. These are not, as might be supposed, merely a multiplication of the ordinary ground glass, they are made of semi-transparent celluloid stretched across the frames. The bed is about 20 feet long when fully extended; and the camera has a double swing, front and back. The bellows are made of an outside covering of heavy rubber, with each fold stiffened by a piece of veneered white wood, 1/4 inch thick. This is lined inside by heavy black canvas and additional lining, making it doubly light-proof. Forty gallons of glue were used in the construction of this huge bellows, and 500 feet of white wood to stiffen it. It is divided into four sections, each supported by a frame, mounted on small wheels, which run on a steel track. The plate-holder is somewhat different from the dark slides that we manipulators of small instruments are accustomed to. It is a roller curtain containing about 80 square feet of ash, 3/8 inch thick, and is lined with three thicknesses of light-proof material. The plate-holder is mounted on a ball-bearing roller. Ball-bearing rollers are also mounted every two inches in the grooves, in which the edge of the curtain slides, thereby reducing the friction to a minimum. The weight of the camera is 900 lb., and the plate-holder, when loaded with the giant plate, weighs 500 lb., making a total weight of 1,400 lb.